The flagship Helio P90 SoC is a notable upgrade over the P70 and is optimized for better hardware, improved camera, and enhanced connectivity. Helio P90 – with a faster CPU, better AI capabilities and support for Google Lens as well as ARCore. 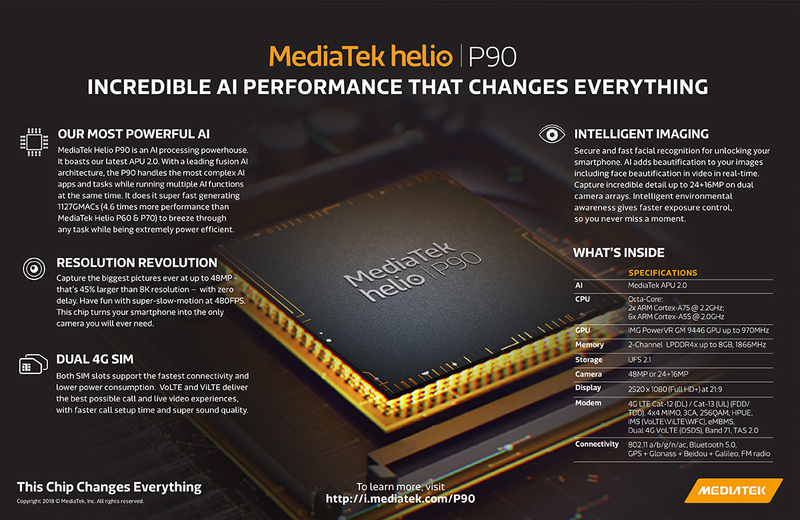 The Helio P90 features two A75 cores clocked at 2.2GHz and six A55 cores at 2.0GHz and this shift from 4+4 configuration to 2+6 is apparently inspired by Snapdragon 670 and 710 aimed at more power-efficient computing. This might result in slightly lower multi-core performance but the more powerful GPU should prevent that from impacting the general gaming performance. Helio P90 comes with PowerVR GM 9446 clocked at 970MHz. Helio P90 now supports Cat 12 4G LTE and this doubles the peak download speed to 600Mbps and supports Dual 4G connectivity. The SoC now supports up to 48-megapixel on a single camera or 24MP+16MP for a dual camera setup. Since the Helio P90 is most likely to be limited to mid-range devices, there is no support for triple cameras yet. The first batch of smartphones powered by the SoC by the first quarter of 2019.